Your Online Horse Book & DVD Store. and many more breeds of Iberian ancestry!" 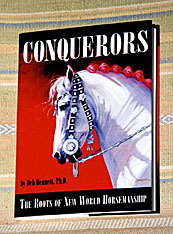 CONQUERORS The Roots of New World Horsemanship by Deb Bennett, Ph. D.
Yearning for a horse book rich with delicious tales? Looking for a solidly-researched volume on the history of horsemanship? Whether you rein a Quarter Horse, travel on a Tennessee Walking Horse, breed for color, ride a smooth Paso, or admire the Andalusian, Dr. Deb Bennett's new book is certain to engage your interest. 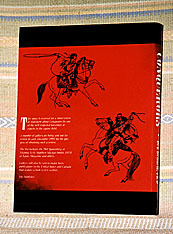 Truly a feast of little-known facts, "Conquerors - The Roots of New World Horsemanship" cogently links the traditions of the ancients with the cattle-handling methods of the conquistadors, gauchos, vaqueros, and cowboys of the New World. No matter how you ride, you have probably heard of the hackamore as a piece of training equipment. But did you know that its history threads back through California to Mexico, Spain, and North Africa to the ancient kingdom of Persia? Or that once upon a time, before Mexican craftsmen discovered how to manufacture a working saddle horn, vaqueros tied their ropes hard and fast to their cinches - or to their horses' stout tails? If you think that Spanish horsemanship involves only the "Western" rider, there are important chapters exploring the links between hunting, gaited riding, dressage, reining, cutting - and mounted bullfighting. Beginning with Columbus' second voyage in 1493, the seeds of all of these were ferried across the Atlantic to the Americas. Bennett surveys Old World riding styles, tack and saddle making traditions, arms and armor not as isolated "phases" in the development of modern horsemanship, but to uncover the roots of the Spanish and Portuguese attitudes, beliefs, and technology which gave rise to current American practices. Linking the knights of old with the knights of the plains, Bennett provides convincing proof that "communication with horses" is as old as the first attempt to bring this magnificent animal into domestication. Necks arched, manes flying, eyes flashing, the horses occupy center stage throughout. Of great interest to the horse breeder, Bennett charts the natural origin of major world bloodlines, following up with hundreds of photographs showcasing more than 40 living and antique types of horse. Both "gaited" and trotting lines are represented - and not merely Andalusians, Lusitanos, Peruvian Pasos, and Appaloosas, but the rarely mentioned Azteca, Criollo, Mangalarga, Campolina, Corallero, Mustangs, and Baguales. With an extensive index and bibliography, here is an invaluable reference to the places and dates of first importation for every country in the Western Hemisphere that has ever bred horses of Iberian ancestry. Easy to read yet packed with pictures, maps, and information, this much-needed volume is a classic which for many years to come will continue to feed horsemen's' hunger to know. 8.5" X 11.0" Hardcover, 432 pages, 500 Illustrations. Special Discount Price : $24.95 plus s/h.